2015 continues to push the climatological envelope by testing the bounds of natural climate variability. Despite the other recent record warm months, June 2015 is in a class of its own in terms of temperatures. 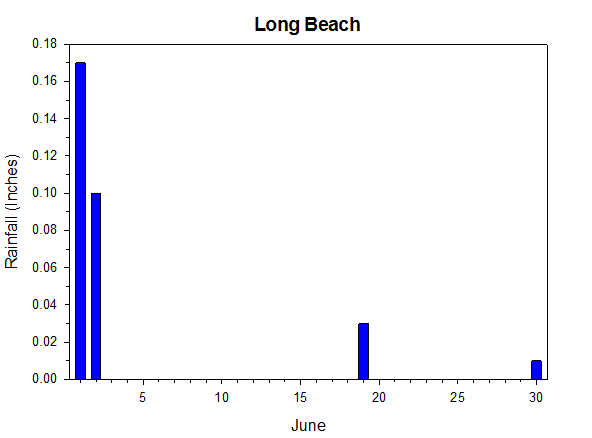 Two major heat waves punctuated a sweltering and dry month of June. Nonetheless, the real weather story of June is not the daily extreme temperatures but rather the monthly average temperatures. Overall, last month shattered the previous June warmth record (1992) by 2.7 degrees, as Prosser temperatures were 8.1 degrees, or 3.1 standard deviations, above normal. 99.7% of all normally distributed events should fall within 3 standard deviations of the mean, such that this June was, statistically speaking, at least a 1 in 400 year event. June was even warmer than a typical July, and was by far the hottest calendar month (relative to normal) on record. The previous record was +6.1 degrees in January 1990. Early in the month, hot temperatures peaked on June 8th, as Benton City reached 106 degrees, while Wahluke Slope fell to a daily low of only 79 degrees. 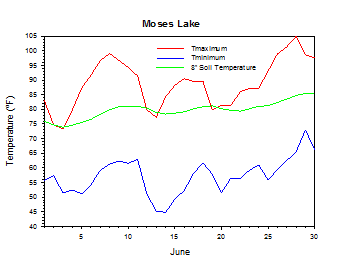 Stifling heat returned again in late June, as the high surged to 114 degrees at PK_McClenny on June 28th, and the low at Wahluke Slope was an unpleasant 85 degrees. The late June heat wave also involved an unusual level of humidity, clouds, dry thunderstorms, and even some wildfire ignitions. 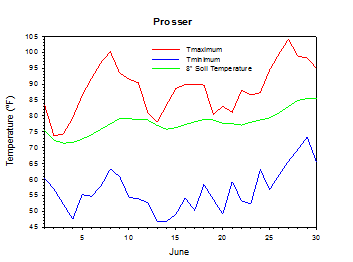 Interestingly, Prosser and several others locations ended June without any rainfall. Average June low temperatures were "only" the second warmest (relative to normal) of any calendar month on record, which is still rather impressive. Highs were an incredible 9.6 degrees above normal, which is far and away the largest warm departure from normal for any calendar month (and any monthly high, low, or mean) on record. The previous record was +7.2 degrees (June 1992 highs). Finally, in a broader context, June was the sixth month since last July to be a record warm month. Last month would have represented an extreme anomaly at any point in time, but its proximity to so many record warm months makes the present time truly historic. Using data from the Western Regional Climate Center, June was also the most above normal temperature month on record (1945 to present) at SeaTac airport, out of a total of 846 months of data, as well as at the Wenatchee airport (1959 to present). Last month was in fact the warmest June on record at the Spokane airport, with records dating back to 1881. Thus, the unprecedented period of warmth that began more than a year ago is not only persisting but accelerating, and shows no sign of waning in the near future. Seasonal weather early in the month quickly transitioned to extreme heat. Benton City rose to 106 degrees on June 8th, while Wahluke Slope recorded a low of 79 degrees. Even as the early heat wave subsided, above normal temperatures generally persisted. The morning of the 13th was a rare cool period, as Ritzville dropped to 31 degrees. Temperatures soared above 100 degrees in most places late in the month. 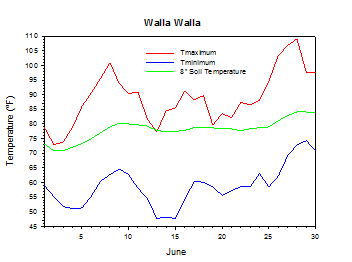 The high at PK_McClenny on June 28th was 114 degrees, while Wahluke Slope experienced a daily low of 85 degrees. The average June temperature at Prosser (WSU IAREC) was 73.9°F, which is 8.1 degrees (3.1 standard deviations) above average. The average high temperature was 88.6°F, which is 9.6 degrees (2.9 standard deviations) above average. The average low temperature was 56.6°F, which is 6.1 degrees (2.8 standard deviations) above average. 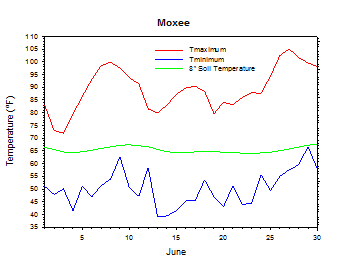 The maximum temperature recorded last month was 104.1°F on June 27th, while the coolest daily high was 73.7°F on June 2nd. 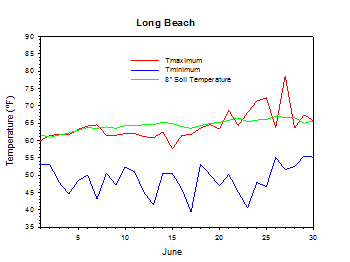 Low temperatures ranged from 73.3°F on June 29th to 46.8°F on June 14th. Daily average temperatures ranged from 87.0°F on the 28th to 63.0°F on the 13th. The monthly precipitation total was 0.00 inches. 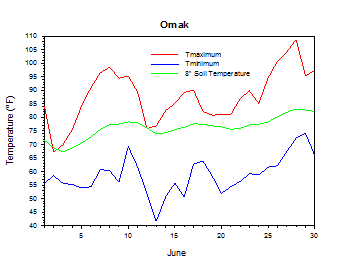 The average wind speed was 4.2 mph, and the average 8 inch soil temperature was 77.9°F. 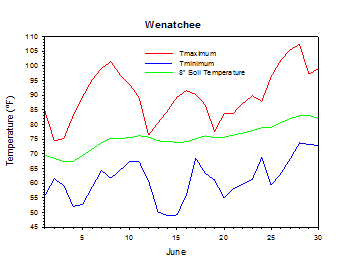 Wenatchee (WSU TFREC) recorded an average temperature of 76.8°F, which is 9.5 degrees above average, while Walla Walla's average monthly temperature of 74.3°F was 8.9 degrees above average. 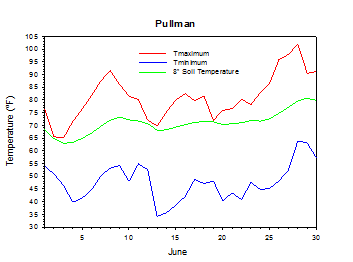 Pullman was one of the cooler spots in the state, with an average June temperature of 71.0°F. In western Washington, Mt. 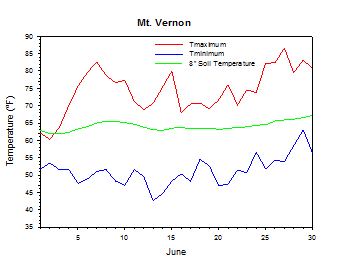 Vernon's average temperature was 62.8°F, which is 4.1 degrees above average. June 8th: The high temperature at the Benton City soared to 106 degrees. 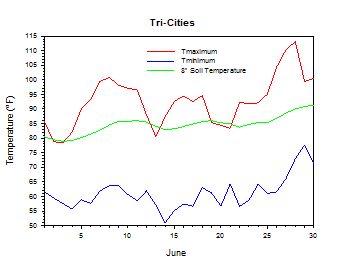 June 13th: The temperature at Ritzville plunged to 31 degrees. June 28th: The low temperature at Wahluke Slope was 85 degrees. June 28th: The temperature at PK_McClenny climbed to 114 degrees. As of early June, strawberry and cherry harvest was in full swing, although heat made for smaller than normal raspberries. Some hail damage was reported on cherries and apples in the Mason area, while winter wheat was turning golden. Later in the month, irrigation water shortages forced some farmers to make difficult choices regarding which crops to water, while dryland wheat suffered from low soil moisture conditions. Apple thinning continued, and crop protectant was applied due to anticipated hot temperatures. As of late June, heat stress and lack of water were still top concerns, as fruit trees became increasingly susceptible to insects and diseases. Low water flow levels on the Skagit River caused junior water rights holders in the area to discontinue surface water irrigation. Otherwise, small amounts of stripe rust was reported on Douglas County spring wheat. On June 23rd, 1992, the temperature at WSU Prosser rose to 105 degrees. 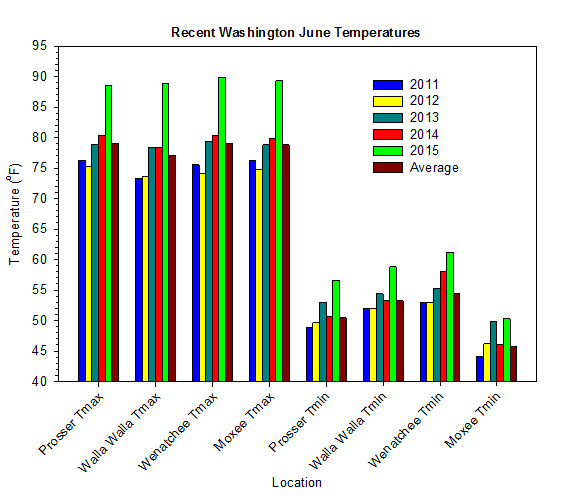 According to the Climate Prediction Center, above normal temperatures are expected in Washington during July and for the remainder of 2015 and well into 2016. There are no clear signals regarding precipitation during July, with drier than normal conditions becoming increasingly likely statewide during the autumn and winter and perhaps beyond. El Niño is still strengthening, and a strong event is likely for the upcoming cold season.